Every Tuesday evening there is an Art Club held at Gibraltar Nursing home, part of the 95 bed Gibraltar Care Village in Monmouth. They use an innovative Household Model of Care which has been rated as Outstanding by the Care Quality Commission. This creates a homely, domestic environment for the residents, who are referred to as “family members,” around ten percent of whom, live with dementia. 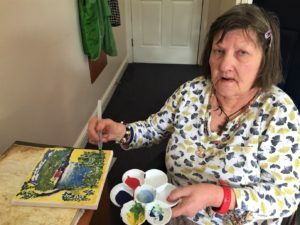 Part of their model of care aims to keep everyone happily occupied, rather than sitting, doing nothing, and they do this by offering a range of activities that can be chosen from. Art Classes are on offer and they have proved to be popular. The weekly Art club is attended by not just the interested family members, but is open to the local community, too. Fiona Mirylees is 73 and a regular at the classes and has been a Gibraltar family member for the last eight months. She is passionately interested in all forms of art, but particularly in her favourite medium, which is painting, using watercolours. These are extraordinary words, coming from a lady who admits she did not really want to live any longer when she first arrived. Fiona has several of her paintings of flowers on display in the communal areas of the home and cites Van Goth as her favourite artist. Since moving to the home, last February, as her painting skills grew, so too did Fiona’s interest in reading and writing. “I used to be shy and terrified of everything, but art has really helped me to come out of my shell.” she admitted. The activities on offer at Gibraltar Nursing Home, such as gardening, music, day trips, playing games, watching films in their own cinema, or dips in the aqua-therapy pool, support their family members to be occupied, stimulated and engaged, which is an excellent way to maintain their quality of life. They also have other benefits, too, such as improving mood and reducing agitation. To join or find out more about the Home and the Art Classes, speak to Gibraltar Nursing Home reception on 01600 775 800. Previous Previous post: Why Doesn’t the UK Have a Women’s Equality Day?